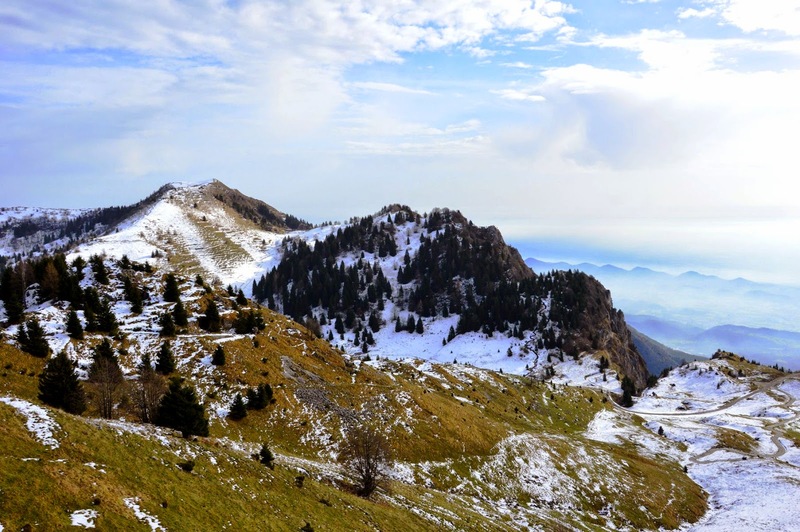 An excursion on Monte Grappa at the beginning of the winter (but also now, taking into consideration the weather and snow conditions) is a highlight for all those who wish to understand fully what the Great War on this mountain range was. A discreet assistant appears in fact during this period: the snow! When a white blanket covers the valleys and the slopes, it is of course very hard to recognize the remnants of the World War One and one must pay attention in hiking here, since you get quickly lost, if you do not know the paths, and small avalanches are also possible. But the first snow is a precious fellow: like a sprinkle of powdered sugar, it paints white the landscape and makes so the trenches stand out with black zigzag which climb the meadows or crossing the woods. We’d like to suggest today a particular suitable itinerary for this purpose. The starting point are the trenches of Monte Boccaor. You can reach them if you park your car near the Rifugio Bellavista, in the Valle San Liberale, and then following the path n.153 and then, on the crest, turning left on n.152, as we suggested in the first itinerary on Monte Grappa, here. The ascension takes about 1h30. You can also eventually drive up to Rifugio Ardosetta (website here), which lies at the mouth of the Valle delle Mure; but we advise against this option, especially in winter, since the road is impassable (but also in summer: after all we want you to hike and to discover these mountains on foot). From the summit of the Monte Boccaor, just walk along the trenches and descend to the Valle delle Mure, where our today itinerary actually start. While descending, you have the chance to look at the near inclines, and recognize the Italian trenches on this side of the valley. And if you look carefully on the other slope, in front of you, you’ll be able to glimpse also the Austrian ones. While walking along the trenches we also suggest to keep silent: you may have the chance to see groups of chamois grazing all around. As you reach the bottom of the Valle delle Mure, you have to climb the opposite slope. There is no numbered path, but you can easily walk among the meadow (pay attention, however, with the first snow they could be quite slippery), making your way towards the summit in front of you. You will reach so the path n.156, which corresponds to the Alta Via n.8, also called “Alta Via degli Eroi” (Heroes High Route), and the Croce dei Lebi. This is a perfect panoramic viewpoint. 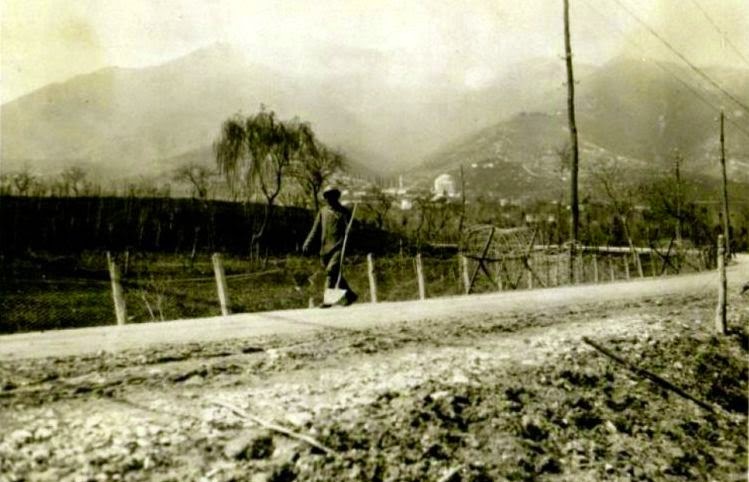 If you turn North you can see first of all Valle dei Lebi, with the Austrian trenches. And in the distance the first Dolomiti range, Monti del Sole, the underlying valley and the city of Feltre, and behind even the peaks of the Pale di San Martino. If you look east, you can see instead the ridge where you are which runs to Col dell’Orso and Monti Solaroli: here there was a crucial defensive line from November 1917 and October 1918. Behind these peaks of the Monte Grappa range, you can also see the Prealps of Treviso. And then turn again, this time to look south. You’ll be able so to admire the Valle delle Mure and the Pian dea Baea, recognize the trenches of the Monte Boccaor, and see in the distance the plain and the Colli Asolani. Finally, turn West so to locate immediately the Rifugio Bassano, that you can now reach easily following the path n.156. This latter is very easy, it turns into a small road in the final section – but pay attention to the ice – and on its side there are some shelters dug in the rock. You will reach in short the Rifugio Bassano, where you can eat and drink something. We suggest you to walk to the near Sacrario Militare and visit also the other monuments nearby. The way back to Val delle Mure is the path n.151: it starts just behind the Rifugio Bassano, leads you to Malga Val Vecchia (an old Alpine hut, which offers refreshment only in summer) and then to a paved road, which runs on the left to the Val delle Mure, at the lower point of the trenches of the Monte Boccaor. The circuit starting and ending here takes about 2 hours, inclusive the break at the Refuge. You can eventually reach the car at the park near Rifugio Bellavista in about 1 hour following the path n.151, which starts exactly here. This is a simple but pleasant itinerary, which can be undertaken during the whole year, but it is particularly fascinating with the first snow, as we already said. If you do not believe us, anyway, don’t miss the upcoming reportage: you will get a clearer idea if you have a look to our photos! This is a complex performance that makes use of different languages to create an extraordinary evocative and poetic metaphor, in which myth and modernity intertwine to express a yearning for peace that still pervades man today despite the widespread unrest that surrounds us. 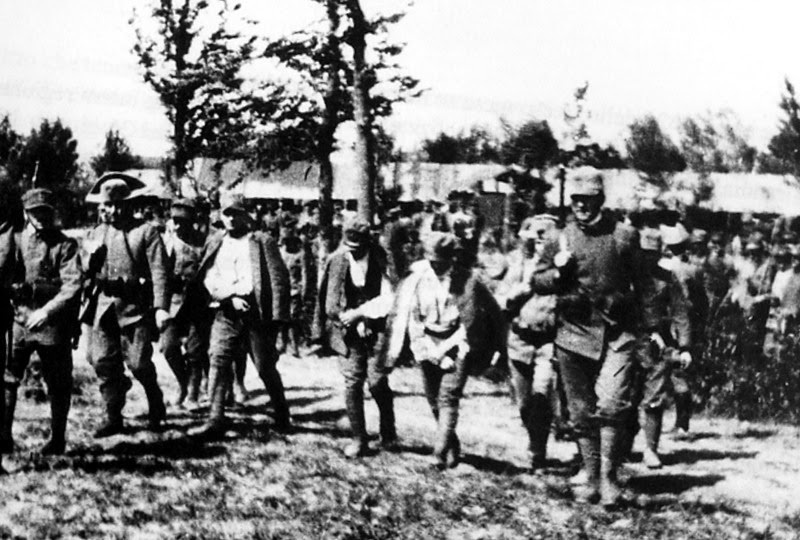 It is a work that springs from the idea of commemorating the 100 years since the outbreak of World War I: the setting of the video supporting the event introduces us into a tunnel at the foot of the hills near Nova Gorica; in other words, into the actual area where the tragedy unfolded on the Italian front. It provides a point of reference but the aim is not to offer a precise, concrete one, because the narrative of the performance is marked by an abstract concept that touches things without illustrating them, progressing by allusion, at times illuminated with stretches of enchanting landscape, offset by the darkness of tunnels; it is in this process that the story of the multiplicity and sometimes conflicting feelings passing through the human soul unfolds. Destructive feelings mixed with explorations of the nature of the soul in an attempt to overcome the eternal status of discord that prostrates humanity: this is the thread that runs through the expansive yet detailed work of Hanna Preuss. The aspiration is peace with ourselves and with the world around us, and the reference to Antigone, with her rebellion against acceptance of the right of power to subvert the consecrated natural and divine rules, intertwines with potentially explosive latter-day feelings of justice within well-structured social situations. Antigone’s impossibility of action combines with the current constraints of a society of superficiality and artificiality that reduces one’s freedom and autonomy of behaviour, producing a globalised conformism. Hanna Preuss’s investigation – which has produced a concept and a sound environment for the piece that reaches epic dimensions – becomes a universal symbol of a human condition that has ancient roots. It is rendered topical by the specificity of the contemporary world through the instruments of unstoppable technological progress which, in the creation of the performance, enables an aural-visual co-penetration, an expressive power of image, sound and word that derives from long experience and the striving of an artist with a broad vision of the world. 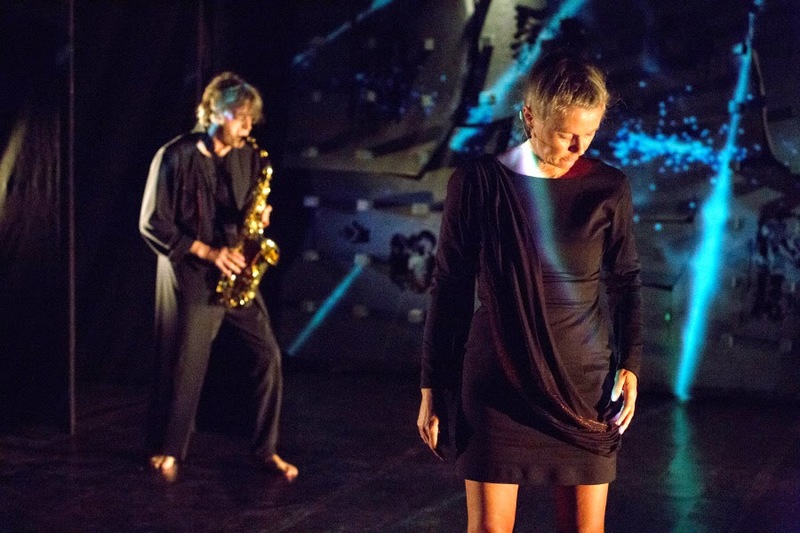 And she has poured her skills and knowledge into the Vodnikova domačija (Vodnik Manor) Sonorous Arts Centre of Ljubljana, of which she is the artistic director. 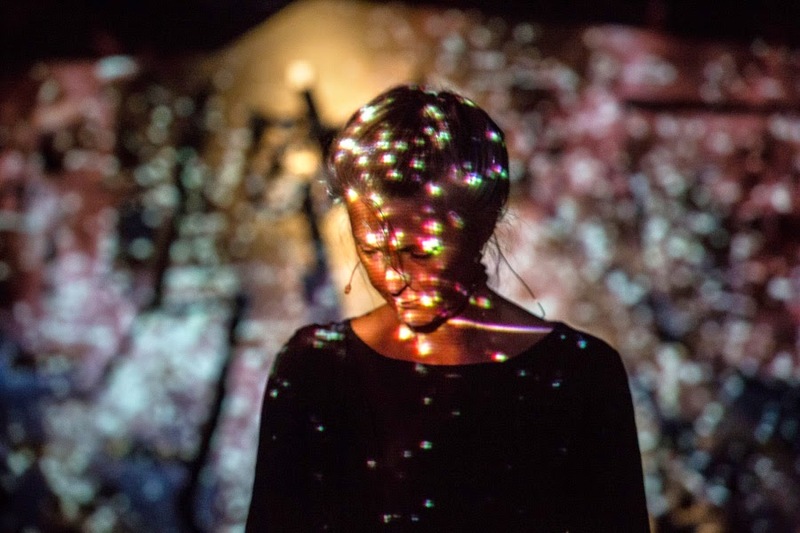 With this formidable intellectual and technological equipment, and in this case supported by numerous international collaborations, Hanna Preuss has, with Pavane for Antigone, blended myth, history, present and a future projection. The story, nourished by poetic abstraction, unfolds with actress Antonella Bukovaz (recently appearing in Topolò) who is also the author. She recites in Italian and Slovene, accompanied by a trilingual text. 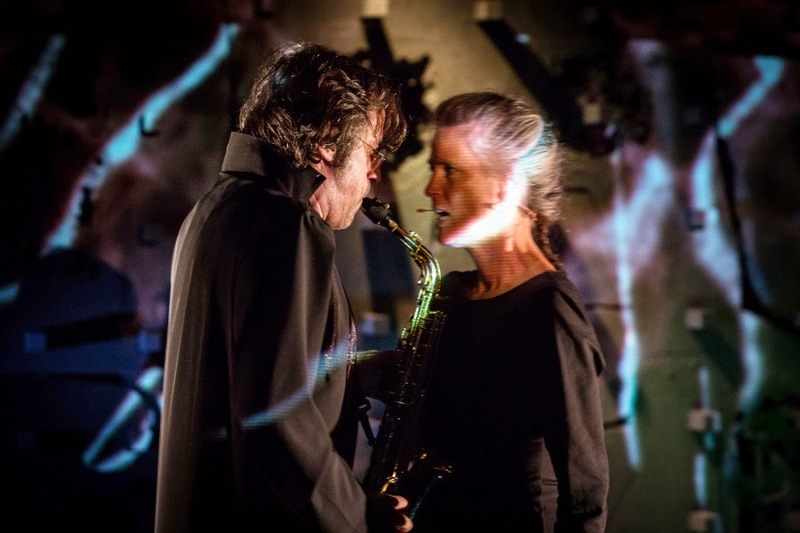 She also appears in the video, walking into the tunnels with a lamp in her hand, a new Diogenes, to lighten the darkness of the place and of knowledge, and appears on stage, overlaying reality and fiction in a combination of great theatrical impact, while the live saxophone played by Antonio della Marina, rips across the stage with its tearing sound. This live-fiction becomes the paradigm of current existential modes. But what prevails is a vibrant sense of poetry, which, through solitude – “only alone, lost, silent, on foot, can I recognise things” (P.P. Pasolini) – through time, through the unraveling of descents and with them the acquisition of good and evil, opens in the end to love. Supported by: Centro di arti sonore Vodnikova domačija (Lubiana), Ministero della Cultura della Repubblica Slovena, Comune di Lubiana, Trieste Film Festival, Teatro Miela (Trieste), Centro per il Film sloveno. We are today pleased to offer an interview with Francesco Correale, historian at the CNRS (UMR 7324 CITERES), Tours. He is the author of an important book – La Grande Guerre des Trafiquants. 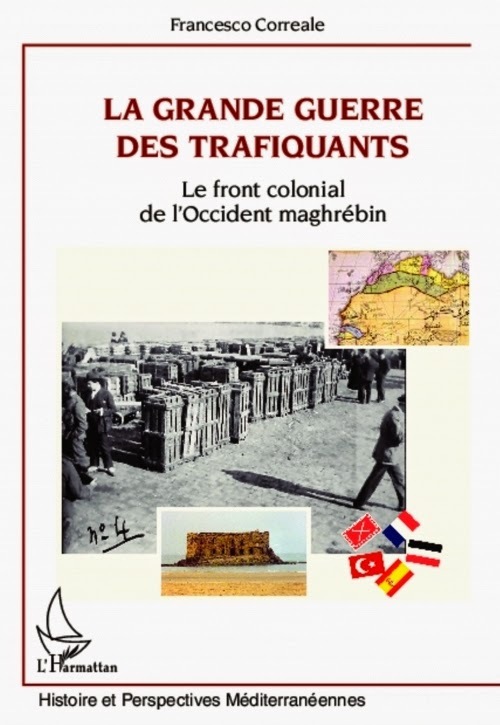 Le front colonial de l’Occident maghrébin (Harmattan, 2014) – in which he offers new insights into another forgotten front of the Great War: the Northwest African countries. Focusing on a (often neglected) aspect of the colonial history, i.e. the weapons smuggling, Correale describes the central role played by resistance movements in the French colonies with the German support and succeeds so in showing how history is not at all the devastating bulldozer that one may think, it leaves underground passages, crypts, holes and hiding places – if we want to recall Eugenio Montale’s poem, that Correale quotes at the beginning of his book. 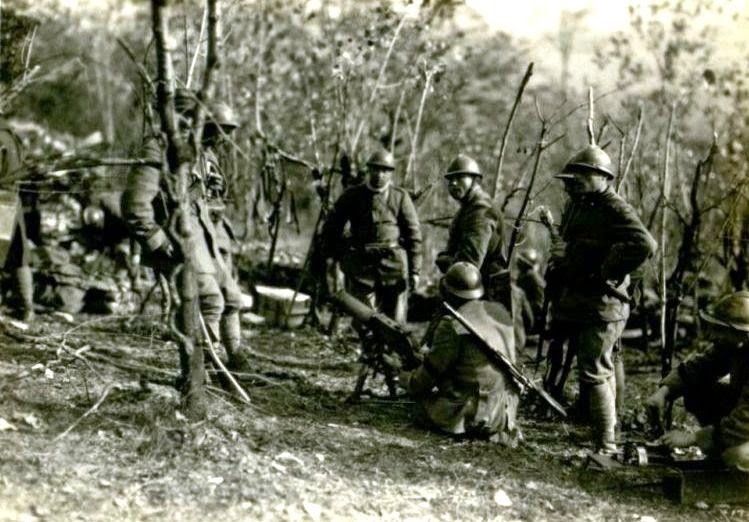 Indeed, the history of the First World War in Maghreb is like an ignored underground passage below the well explored landscape of the European fronts; we can now start to walk anew this passage with the help of Correale’s researches that we can approach in the following interview. This is a unique chance to discover at least few central features of this Mediterranean shore of the war and realize how little we know about the history, the culture and the traditions of these countries. We thank therefore once again Francesco Correale. WWIB: Can you briefly explain how the anticolonialist movement in Maghreb was related to WWI? FC: Nationalist movements in Maghreb are connected to World War I by a “triple link”. First by the participation of some people in the military operations against the colonial power in situ, in the context of the Great War in North Africa. It includes not only those people who will afterwards enter, in one way or another, the national liberation movements in the different Maghrib Countries, but also those people who become a sort of “founding myth” of the fight against European colonialism and therefore a reference point for the next generations of nationalists. Second by the participation, bon gré mal gré, of conscripted North African soldiers into colonial armies (the so-called “troupes coloniales”), particularly the French ones, to fight on the European frontlines. 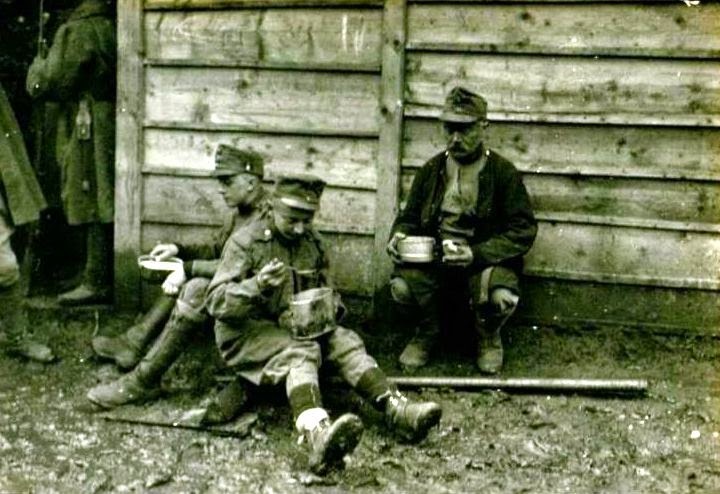 Joining both European trenches and political circles (especially the Socialist Parties), they developed their political consciousness and then spread it once they returned to their countries. 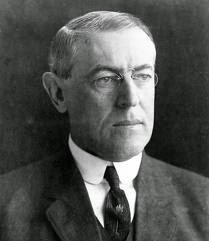 Third by the echo of Woodrow Wilson’s statement about the new order which had to be established after the end of the Great War - the so-called Fourteen Points. They had a strong impact in terms of claim of rights expressed by most of the political leaders in Maghrib countries towards colonial administrators after the end of the Great War and until the independence. WWIB: Could you introduce the protagonists and the main events in the history of the Great War in Maghreb? FC: In my book I analyse the First World War in current Morocco, Western Sahara and northern Mauritania. The actors in these countries are the French and Spanish colonial authorities, on the one side, and, on the other side, the German-Turkish spy network with its head office in the neutral Spain. 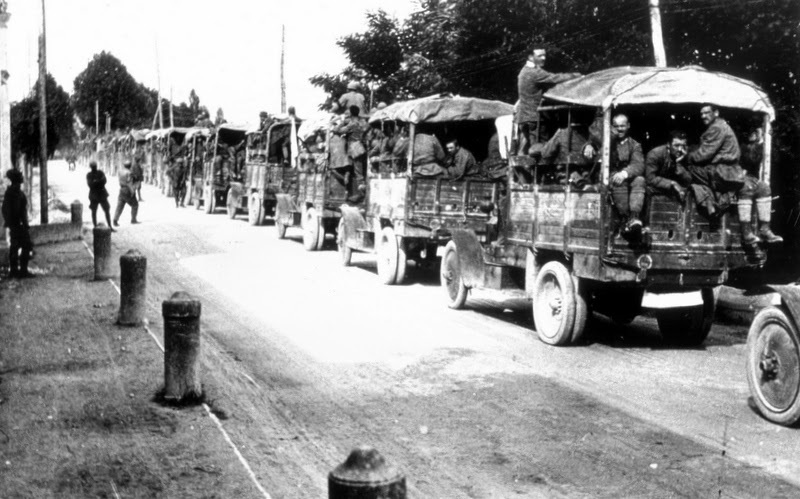 German-Turkish authorities sent weapons, money and instructors to most of the anti-colonial resistance leaders. But the very central actors are the leaders of the resistance movements. I. I. Ahmad al-Raîsuni, active in the North-West region placed between Tangier and the French military zone, within the area of Spanish influence. Sometimes operating in perfect harmony with the Spanish troops, he kept a strong anti-French attitude and, by virtue of his title of Sharif (i.e. descendant of the Prophet Muhāmmad), he seemed to aspire to the Moroccan throne, or, at least, to become“Khalifa” and represent the ‘Alawi Sultan in Tetuan, the capital of the Spanish area. II. Abd al-Malik, active between the eastern borders of the Spanish area and the region of Taza, in the centre of the French Morocco. This actor and his political views are usually scarcely mentioned in history books. Last son of the Algerian Emir ‘Abd-al Qādir,' Abd al-Malik was born in Damascus and settled later in Tangier, serving the French police in the town. A few months after the outbreak of the hostilities in Europe, he became a fervent partisan of the German-Turkish coalition; this choice was more in agreement with his origins. He created in the middle of the French Protectorate a small army, which was supported with weapons, money and men by the Germany through the Spanish Moroccan area. Impregnated with pan-Islamic principles, he is probably the most idealistic of the leaders of the resistance, but it was quite hard to him to impose his power over all the tribes. Indeed, they considered him as a “foreigner” because “alien” to the Moroccan environment. III. Ahmad al-Hayba, active in the Southern region, from the Sūs to the Mauritanian Adrār. Proclaimed Sultan of Morocco in August 1912, in Marrakesh, he was defeated by the French army in September. He took over the reins of the anti-French struggle since the beginning of the hostilities in Europe. He was the son of Sheikh Mā’ al- ‘Aynayn, leader of the Saharan anti-colonial resistance between 1905 and 1910. In fact, his political action can be considered the pursuit of the agenda of his father, who died in 1910. Al Hayba settled in southern Morocco but had emissaries all over the Western Sahara. Colonel Francisco Bens, the Spanish officer in charge of the administration of the colony of Rio de Oro since 1903, was forced to negotiate with Al Hayba in 1916, in order to establish the Spanish settlement in the region of Tarfaya, the southern zone of Spanish influence in Morocco. Even al-Hayba (often improperly called “Blue Sultan” from French and Spanish historiography, an appellation used to designate his brother and successor Murabbī Rabbū) aimed for the Moroccan throne, seriously worrying so General Lyautey, the French General Resident in Moroccan Protectorate. Lyautey feared a change of dynasty like that occurred centuries before, when the Almoravids and the Almohads came from the areas of the Sahara to conquer all territories until the al-Andalūs. These three chiefs were considered by German and Ottoman authorities the main leaders of Morocco-Saharan resistance movements against French colonial powers. Nevertheless, it is worth mentioning the so-called “Berber resistance” in the Middle Atlas as well. Berbers brought together various leaders and, quite independently from the strategies of Berlin and Istanbul, led a struggle against the colonial troops. 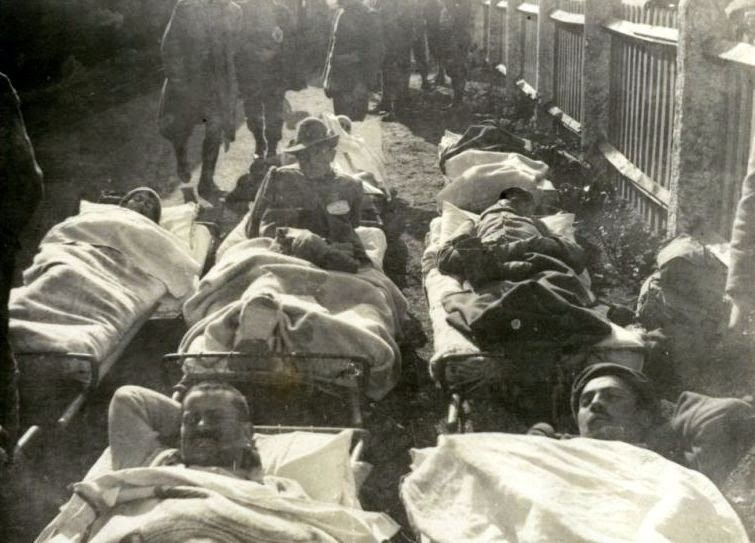 One of the most evident consequences was the French defeat, on 13th November 1914 in El-Harri: 600 dead men (including 33 officers), a high number of wounded and disappeared soldiers and two batteries of cannons got lost. Regarding the geographic areas that I didn’t take into account in my book, it is worth emphasizing the anti-Italian action of the Sanūsiyya, a Muslim political-religious Sufi order and tribe active in Libya and the Sudan region, which received the support of Turkish and German reinforcements. We should also mention the Niger, where a revolt took place of 1917: it is known as the “Kaocen revolt”, by the name of the Tuareg chief, also supported by German instructors against the French. It is a fact however that the history of First World War in North Africa suffers from an important historiographical void. The development of new researches on this topic could bring out therefore new and unexpected actors. At the same time, it’s worth underlining that the above mentioned leaders of the anticolonialist resistance, who were active before the outbreak of the Great War, kept directly in touch with their Turkish-Germans allies (like Ahmad al-Hayba or ‘Abd al-Malik did), otherwise they failed to link (although indirectly) their action with the Great War historical and political context. They took advantage of the emergency situation as consequence of the War in the colonized areas of Maghreb. No surprise that the colonial authorities feared a great revolt assisted by Turkish-German forces across North Africa. WWIB: How did you start to work at this book? Which sources did you use during your researches? FC: The book is the result of my doctoral thesis, defended in 2003 at the University of Aix-Marseille I, under the direction of Robert Ilbert. Actually, my previous researches were not really focused on the First Wold War. I was rather interested to the issue of weapons traffic in Moroccan-Saharan regions, between the late 19th and the early 20th century. Then I came across a body of archives completely dedicated to the First World War and to be more precise to the conflict in Morocco; so I decided to focus my text on the years 1912-1918. The collection of documents was carried out in the most important archives in France (Archives of Foreign Affairs, which was at that time located in Paris, while today it is in La Courneuve; the Archives Nationales d’Outre-Mer, in Aix-en-Provence; the Military Archives in Vincennes; the Centre of diplomatic Archives in Nantes), in Spain (Archivo General de la Administración, Alcalá de Henares and Archives of Foreign Affairs in Madrid), in Belgium (the Archives of the Foreign Affairs in Brussels), and of course in Moroccans (Archives of the Protectorate stored in Rabat). WWIB: We know that you often work in loco, so we can suppose you are an expert of the culture of this region. Can we talk about a WWI remembrance in Maghreb? Is there any interest for the Centenary? Do people still link WWI and colonialism? FC: A memory of the First World War can be found in Morocco, but it does not mention the events I write about in my book. These events have been “forgotten” in the name of a dynastic legitimacy (that of the Royal family at the power), which was specifically questioned by the leaders of the anti-colonial resistance. 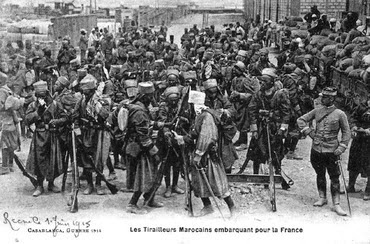 The memory of World War I in Morocco is mainly related to the “tirailleurs marocains”, who actively fought on the European fronts. Very few references can be found about the close relationship between colonialism and the Great War. 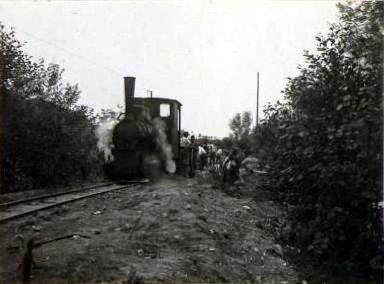 The interest for the Centenary is therefore connected to the claim of a role of Moroccan troops in the defence of the French soil against the German invasion. This attitude often seems the result of a cultural subordination (in a “Gramscian sense”) of the Moroccan to the European point of view and celebrative registers of the Great War, or to affirm in support of the present generations the rights to live in France (and in the other European countries) given that their grandparents fought there during the World War. These attitudes omit the fact that, for example, the “tirailleurs” were often recruited by force or that many appealed to the extremely critical social and economic conditions of the Moroccan population during those years. WWIB: Do you think that the Centenary may offer an opportunity to increase the attention of the scholars also for these peripheral fronts? FC: I think it is a duty for the organizers of the various events related to the Centenary, to affirm and remember that the Great War took place, in fact, “in the world”. In my opinion, the centenary offers a central opportunity to stress the “worldwide” dimension of the Great War. The carnage that took place in Europe was not the unique consequence of that conflict: an important historiographical operation has to be made to improve the knowledge of the other fronts. WWIB: Does it still make sense to speak about peripheral fronts if we all call it the First “World War”"? Isn't this a kind of contradiction? FC: Yes, it is a contradiction that has its roots in the ethnocentrism of the First World War European historiography. According to this historiography, the German-French front is the most important place of the war. Hence, all the other fronts turn out to be marginalised, including the other European fronts. Stressing this point, I call into question not only the spatial dimension of the conflict, but also the temporal one. How to deny, for example, that the World War I could have begun when Italy invaded Tripolitania and Cyrenaica? How to forget the Ottoman-Italian war, in 1911, or the Balkan wars in 1912, where all the protagonists of the following WWI were ready to enter a larger theatre of conflict in 1914? A most truthful perspective may be opened if we consider a unique historical continuum starting from 1911. It would be a pity for the scientific community not to take advantage of the opportunity offered by the centenary, to keep the memory of the Great War in Europe alive, but also to revise other important aspects of this crucial event such as, for example, the chronology of the conflict.